ROOMS 35 EUROS PER NIGHT. TAXES AND BREAKFAST INCLUDED. The hotel, situated in the mythical village of Santillana del Mar, in Cantabria, it’s well known for its cultural treasures such as its monuments, history, and because it’s the cradle of the civilization (Altamira Caves); gets into the virtual world. Our hotel has wanted to give a big step towards the new technology and that’s why we have created useful, easy and fast to show our hosting services and so you can search for the information you need, see some pictures of the hotel and its surroundings. One of the best and strongest characteristics of this web page is that it’s one of the first web pages in using the new system of responsive or adaptable design, what means that the webpage will automatically get adapted to any kind of device from which the web page gets opened: smartphone, tablet, laptop…preserving the identity of its design. 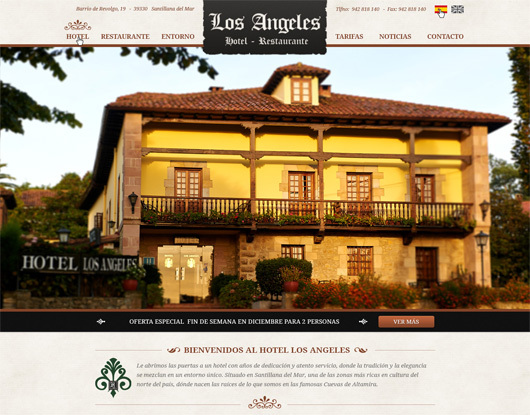 The web page has been created by the leading Cantabrian company of marketing online: Interactiva Clic. From the hotel we would like to welcome you all to Los Angeles 2.0.